Stop by Garnet Mercantile or the White Pine Public Museum and you might be fortunate enough to find artist Laura Rainey at work sewing and beading custom moccasins. Rainey grew up with her family in the hills that ring the north edge of Ely. She left for high school near Las Vegas and then married and traveled widely. Along the way, she worked 10 years at the Nevada Test Site, now called the Nevada National Security Site. 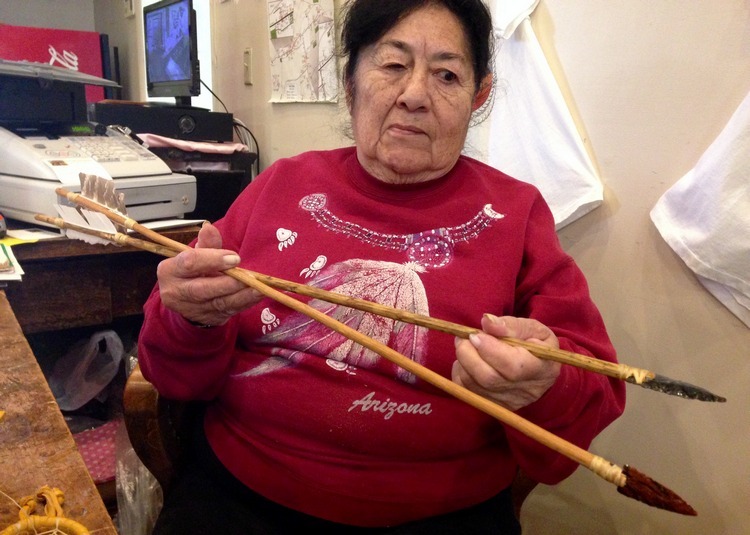 She also owned Smoke Signals stores in Pahrump and Ely, and traveled the Pow Wow Trail selling her handmade moccasins, dream catchers, buckskin jackets and dresses, beaded barrettes made on a loom, and knives crafted from antler and obsidian. Rainey returned to Ely in 2000 to dedicate herself to art, outreach and education. One talk Rainey likes to bring to school groups uses two arrows. On war arrows, the feather is mounted perpendicular to the tip, because human ribs go sideways. For hunting, the feather is mounted parallel with the tip. “Four-leggeds’ ribs go up and down,” she said, fanning her fingers. Laura Rainey holds a war arrow (with black obsidian point) and a hunting arrow (with red point). War arrows have their feather positioned perpendicular to the point, while hunting arrows have the feather mounted parallel to the point. In her hunting days, Rainey preferred to hunt with bow and arrow. “I’ve gone with rifles,” she said, “but I don’t like how loud it is.” On her wall at home, she has a four-point buck mounted, and the arrow that killed the deer. Traditionally, hunters gathered venom from rattlesnakes to coat arrows. A snake would be made to bite into and expel venom into an animal’s liver. The arrows could then be passed through the organ and glazed with toxin. 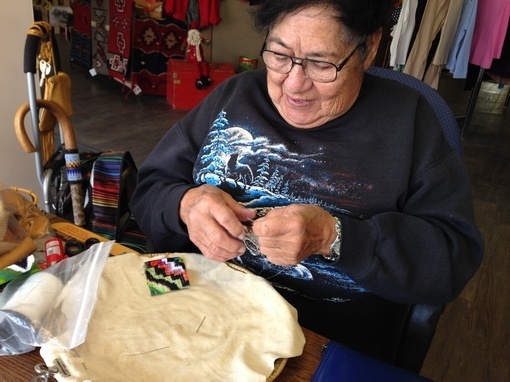 Even as she crafts jewelry from local Garnet Hill gems, traces patterns for custom-moccasins, and welcomes visitors to Ely, Rainey’s passion is educating area children. When Rainey visits a classroom, she makes dreamcatchers with the children in the traditional way. The weaving resembles a spider’s web. It’s estimated, she said, that the Shoshone will lose their history in the next 10 years unless stories and lessons are shared. 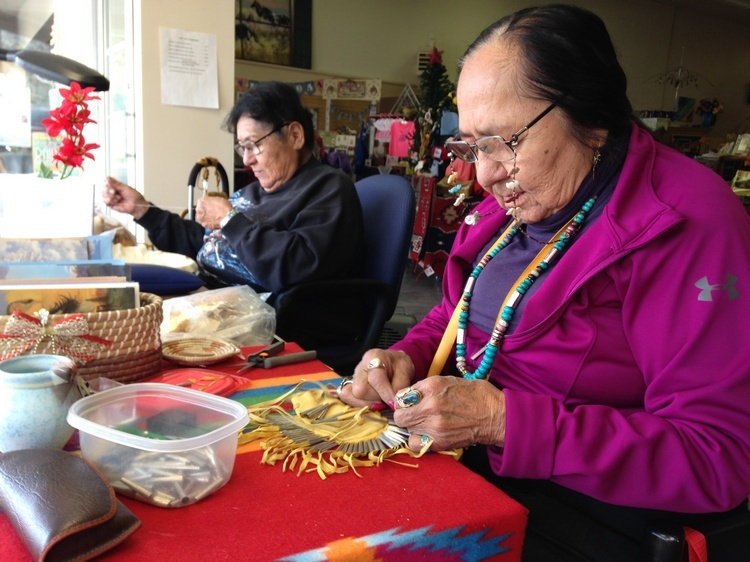 To contact Laura Rainey about custom leatherwork, beading, American Indian jewelry, jewelry repair, or White Pine County history, call her at 775-296-1362.